@rjbdvm1 Wow, was reading your blog post on fleas. I had no idea there are so many types! 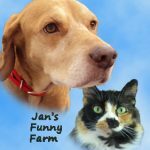 Thanks for visiting my blog, Jan. Have you read the post I just published about Ticks?